The full £20bn cost of renewing the UK's Trident nuclear deterrent must be paid for by the Ministry of Defence, George Osborne has said. Traditionally, the Treasury has always found the money for the submarines. The chancellor's comments come as Defence Secretary Liam Fox warned it would be "very difficult" to maintain other MoD projects if more than half its budget went on funding Trident. It may spark a political row, said BBC defence correspondent Jonathan Beale. The MoD is already having to contemplate cuts in its budget of between 10% and 20%. Speaking from New Delhi, where he was accompanying Prime Minister David Cameron on his visit to India, Mr Osborne said he had made it "absolutely clear" the Trident costs were part of the defence budget. "All budgets have pressure. I don't think there's anything particularly unique about the Ministry of Defence. "I have made it very clear that Trident renewal costs must be taken as part of the defence budget," he said in an interview with the Bloomberg newswire. But in the Metro newspaper on Friday, Dr Fox warned against complacency as he defended the renewal of Trident as the most "cost-effective way of maintaining Britain's nuclear deterrent". There is some internal politics going on here. There is no love lost between Downing Street - and by that I mean David Cameron and George Osborne - and what Liam Fox is doing at the Ministry of Defence. This is sending out a big signal that the MoD is going to have to take on the cost of developing the Trident replacement. Having to consider meeting the full cost of replacing Trident is going to be a huge issue for the defence secretary. The MoD has got itself into problems in the past with procurement and wasted a lot of money, so this is perhaps also sending out a very blunt message. This will be something that the Liberal Democrats will be relieved to hear - the grounds are shifting on Trident, which before was off the table when it came to cuts. "Should Iran become a new nuclear weapon state, Saudi Arabia, Egypt and Turkey would be likely to follow suit and we could see ourselves in a new nuclear arms race," he said. "There are a lot of real dangers out there and I'm not sure people have really focused on them." He told the paper reducing the Trident fleet to three submarines would put extreme pressure on the UK's policy of keeping one nuclear missile-armed craft at sea at all times. BBC defence correspondent Jonathan Beale said it had become clear in recent weeks that the MoD and Treasury had been "locked in battle" over who should foot the Trident bill. He said although the MoD had officially given no reaction to Mr Osborne's comments, they had been met with "surprise and some anger". Our correspondent said the £20bn cost - which was more than half of MoD's annual budget - would have "huge knock-on effects", such as whether the UK could afford two new aircraft carriers for the Royal Navy, or the RAF could afford to buy 100 new fighter jets. BBC political correspondent Robin Brant said internal government politics was also at play, with concerns that Mr Fox is trying to defend MoD spending too robustly. "There is no love lost between Downing Street - and by that I mean David Cameron and George Osborne - and what Liam Fox is doing at the Ministry of Defence," our correspondent said. The Scottish National Party has called for Trident to be scrapped to preserve funding for the rest of the armed forces. "Absorbing Trident into the core defence budget is unsustainable and would have a devastating impact for spending on conventional forces, which are already overstretched," a spokesman said. "The implications of this decision could not be more serious." John Woodcock, Labour MP for Barrow and Furness - where the submarines would be built - said the decision would add to the concern the government was "hell-bent on cutting budgets with a speed and brutality that is simply not in the country's long-term interests". The government is carrying out a strategic defence review of the shape and size of the UK's armed forces, but has said it would not be looking at whether to replace the ageing submarines. The Unite union warned that 13,000 jobs could be lost if Trident was delayed because the MoD had to bear the full renewal costs. National officer Bernie Hamilton said: "Any lengthy delay will mean that Britain is in danger of losing the skills and ability to build such submarines." He said: "The picture gets worse if Osborne continues to insist that the MoD, already facing cuts of 10-20% as part of the Comprehensive Spending Review, has to slash conventional weapons' programmes to pay for Trident. "We could then be talking about losing thousands more jobs than the initial 13,000 - that figure will be dwarfed as the axe falls." Unite also voiced concern about the future of its 15,000 members working for the MoD, including tank fitters and aircraft refuelers. On Wednesday, the Royal United Services Institute urged ministers to consider dropping the requirement of always having a nuclear submarine on patrol at sea, in order to save money. Trident vessels currently provide a nuclear deterrent because the submarines, under the waves in secret locations, would be almost impossible to destroy in a pre-emptive strike. Critics say Trident is too expensive, and there have been calls to either scrap the nuclear deterrent or switch to a cheaper land-based missile system. 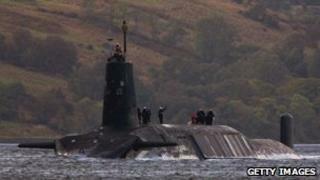 Trident: Is there a cheaper alternative?